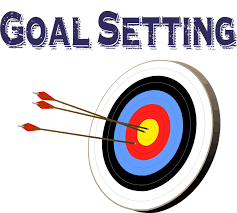 Home Goal Setting Why are Goals important? The competitive organization does not focus on the present issues arising from the competitive market place; it is focused on gaining the competitive advantage in the near future. It needs a strong goal setting process as it can gain and keep the competitive advantage. The goal setting process is closely related to the strategic planning process. The strategic plan and the strategic agenda define key milestones for the year. They have to be elaborated into financial targets; these targets have to be elaborated into the individual goals for top managers. They have to cascade them down the organization. The performance management is an essential part of the business strategy implementation. The Finance guys can deliver measures, and they can report the progress from the new initiatives. However, the goals for employees assure that the business strategy is implemented within defined milestones. The top management creates the story around the business strategy. The executives do not present just numbers. They build a story, which sells strategy. They have to split the strategy into milestones, and they have to describe particular milestones. The role of executives is in the definition of target values for each milestone. They should set priorities, and they should reach the high-level consensus. Line managers should work with the particular milestones and target values. They should apply targets to their departments, and they should prepare the proposal for the top management. Each executive should approve goals of his subordinates. The executive is responsible for the alignment of goals for units with the business strategy. Employees work with the unit goals. They are pushed to cooperate through the organization. However, goals for employees cannot be just about hard targets. Employees have to develop their skills, competencies and the potential. They have to increase their value for the organization. The meaningful goals make a difference. Employees and managers focus their effort. The top management can plan strategic initiatives, which lead to gaining the competitive advantage in the market. Employees are motivated, as they participate on the success of the organization. Employees need goals to deliver the value added. They do not do things; they will deliver results. It makes an enormous difference. The organization with goals can plan its activities and its investments.